The chart example below shows an extreme Angle of Descent™ into the lowest low as indicated by the first black line under price on the left side of the chart, before a bottom commences. Even as this final sell down occurs, it is obvious that the steepness of the Angle of Descent is unsustainable. The MetaStock Quiet Accumulation TTQA indicator in the bottom chart window is exposing smaller fund capitulation as the stock tumbles. 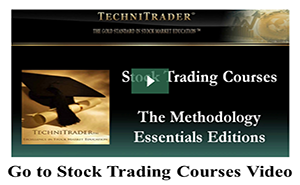 The TechniTrader Quiet Accumulation TTQA Indicator was developed by TechniTrader for MetaStock users. The sideways pattern after the low is indicative of the giant Mutual and Pension Funds buying incrementally with Dark Pool controlled bracketed orders over time. Since some Retail Traders and High Frequency Traders are still trying to sell short against the strength of the giant funds buying, the up and down day to day price pattern forms. This is underlined with the first black horizontal line on the left side of the chart. Then as the stock moves up to the first tier of resistance around 35-37, the High Frequency Traders realize that Dark Pool buying by the giant funds has been going on. So they rush to buy in quickly creating a buzz in the Retail Trader world, and short-term Swing Trading occurs. At this time the giant funds have accumulated what they wanted, and so the news spreads of their buying. This creates speculative runs due to emotional at market buying by smaller funds. The stock runs up and then hits stronger resistance where it stalls. This price run action is underlined and is the last vertical line prior to the drawn box. Momentum evaporates and the stock moves sideways in a Platform Candlestick Pattern as indicated by the box and underlined in green. Price could have just as easily started to move down into a correction. But it didn’t because as profit taking began by the High Frequency Traders and other Professionals short-term swing trades, the giant funds buying in Dark Pools entered again controlling price tightly with their orders off the exchanges. Platforms are a “value oriented” Market Condition where the dominant buyers are large to giant lots buying incrementally over time. This is usually based on Earnings Reports. The stock slides downward during the latter part of the sideways action. The giant funds are not selling but rather have stopped their accumulation, and a void of buying by these giant lot buyers causes a slip-slide downward action as shown by the middle red arrow. If you study this price action closely, you will see that the stock stops just at the lowest low of the Platform as indicated by the first red arrow. This indicates where the giant funds stopped buying. Then as the stock slipped to the low range their buying started again briefly as shown in the horizontal candlesticks between the middle and the last red arrows, underlined in green. Next High Frequency Traders and Professional traders started buying the stock creating another speculative run, which then shifted to a Peaks and Valleys Trendline Pattern. The shift of trendline patterns throughout this MetaStock Chart shows where one Market Participant Group started and stopped buying the stock, and then a different Market Participant Group took control of price. 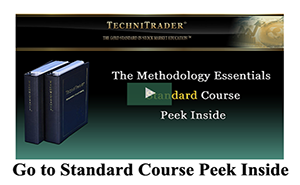 By understanding that the upward trend cycle has many different tiers and layers of a variety of Market Participant Groups, you can quickly identify which is in control of price at what time. By knowing who controls price reveals how price will behave in the near term, and that tells you what to expect next. For information about getting the TechniTrader Quiet Accumulation TTQA indicator email info@technitrader.com.